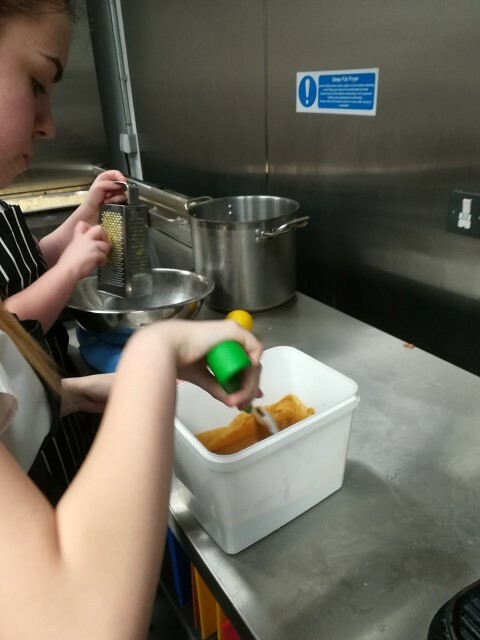 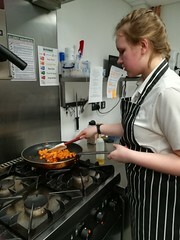 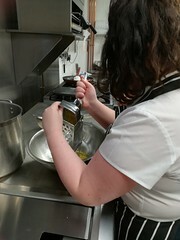 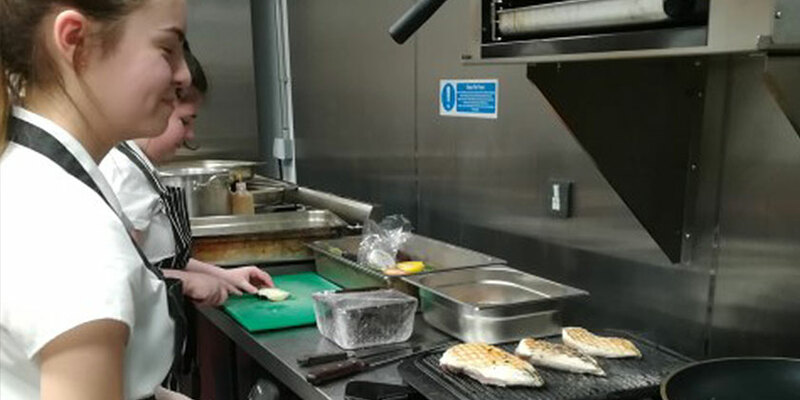 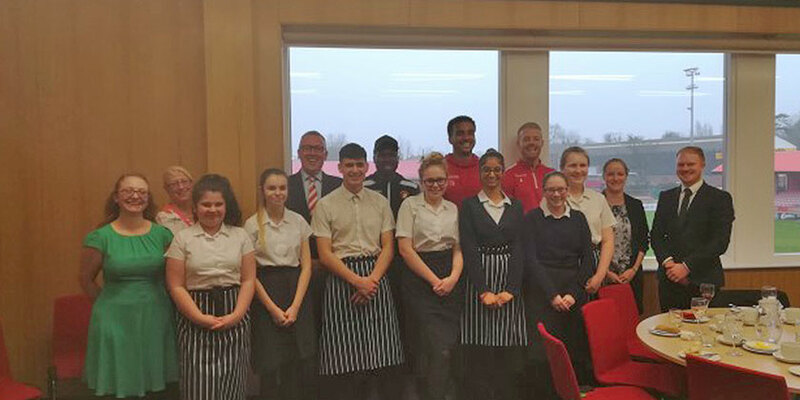 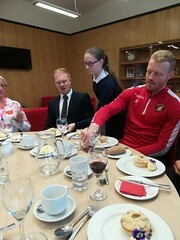 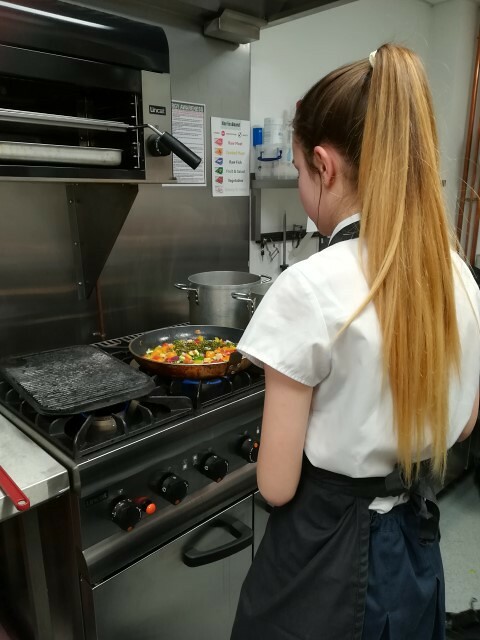 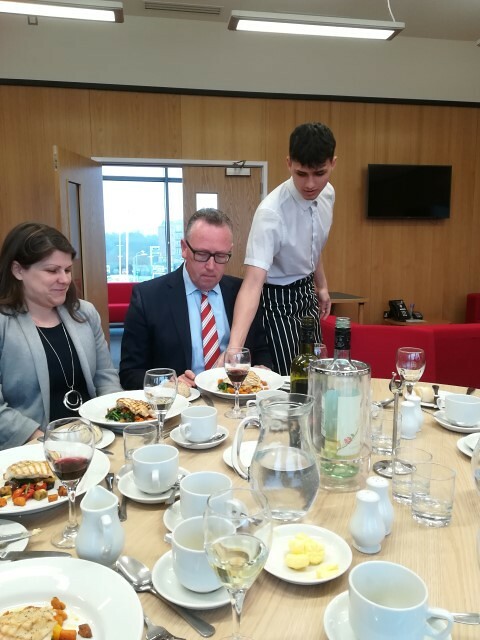 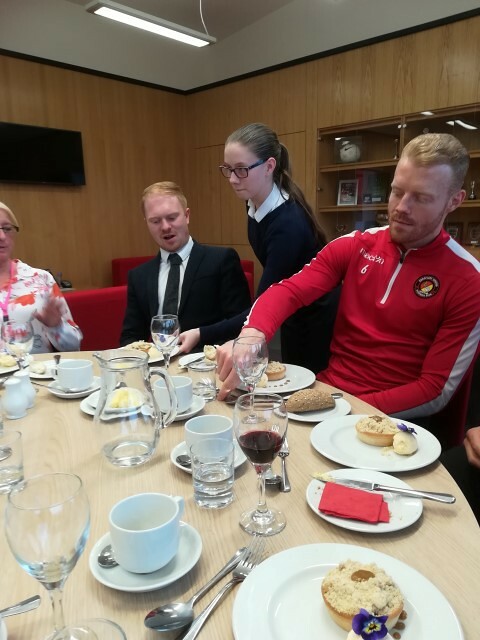 After having to reorganise the “fixture” due to a combination of Parents’ Evenings, snow and player availability, the much anticipated EUFC and Ebbsfleet Academy “Masterchef” cook-off took place in the Fleet’s new kitchen and boardroom last Thursday afternoon (12th April). 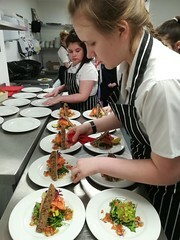 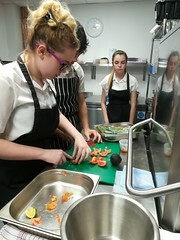 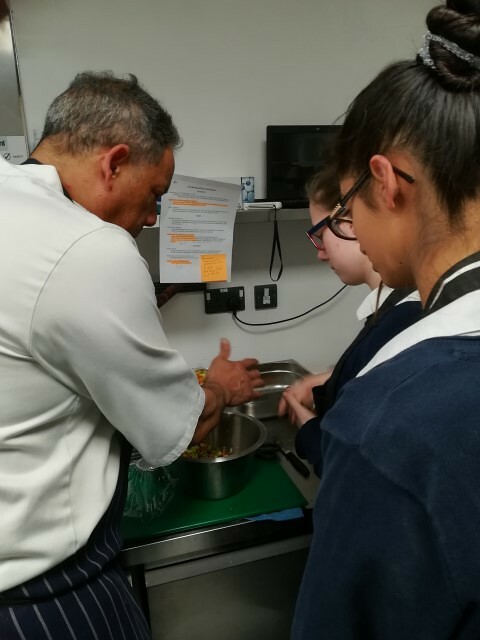 Ebbsfleet Academy Year 11 students Ritika, Shannon, Jessie, Franki, Berni, Jayden and Bethany accompanied by their Food Technology teacher, Laura Dickman, were put through their paces by Fleet executive chef Simon Smith in designing and preparing a three-course dinner for 10 in the Kuflink Stadium’s kitchens, to be served in the Fleet Boardroom. 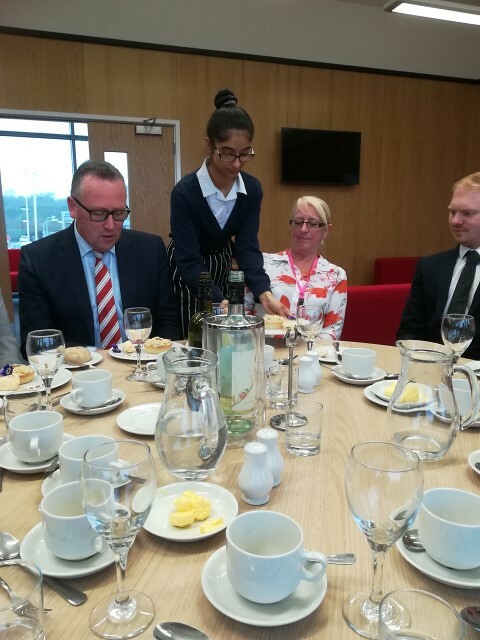 Guests included Fleet director, Stuart Butler-Gallie and Kenny Clark who, with their “Community hats” on, had discussed and planned the event with Laura, hugely assisted by Fleet catering operations manager, Tanya Parr. 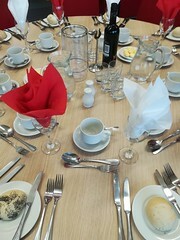 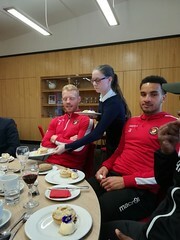 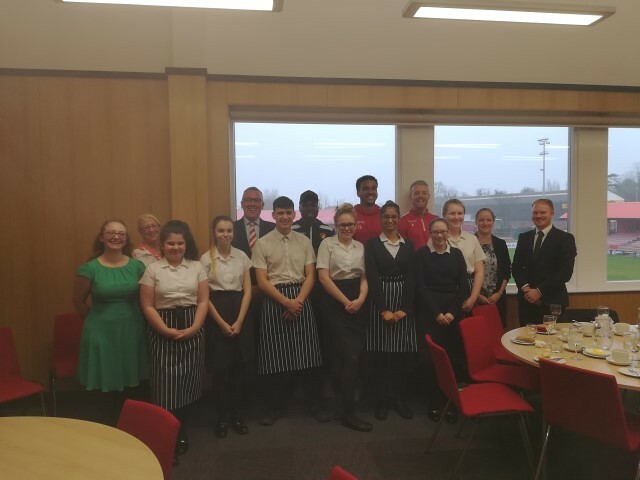 Stuart, Kenny and Tanya were accompanied at the table by players Aaron McLean and Chris Bush for this culinary experience. 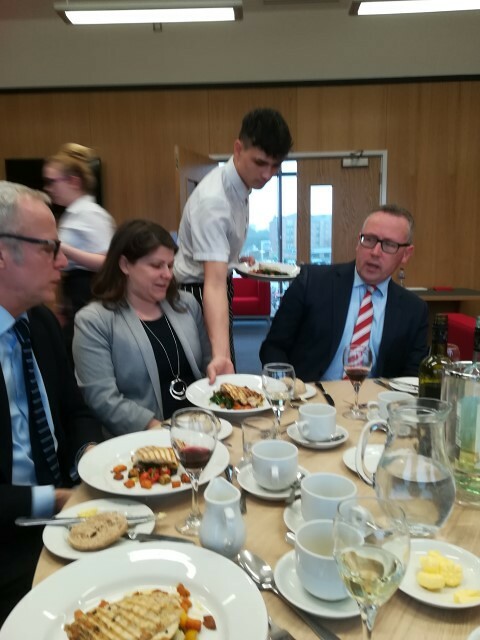 The Ebbsfleet Academy was represented by vice principal, Crystal Cardnell; director of learning for technologies, Jonathan Kelly; English teacher, Tyler Knuckles; and Humanities teacher, Hilary Samuels. 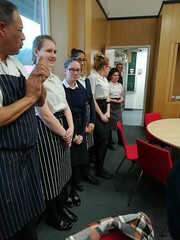 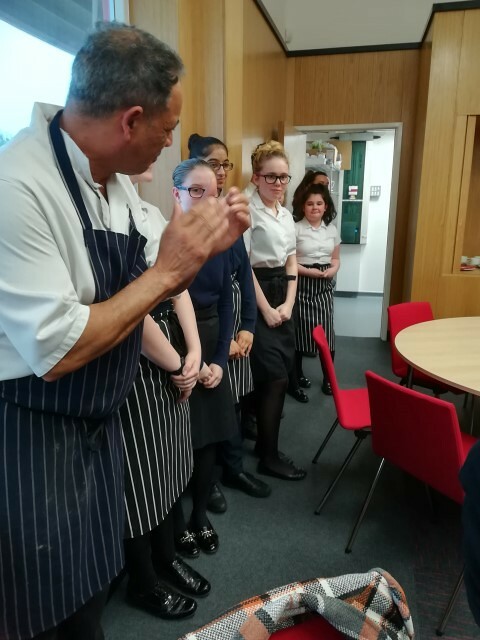 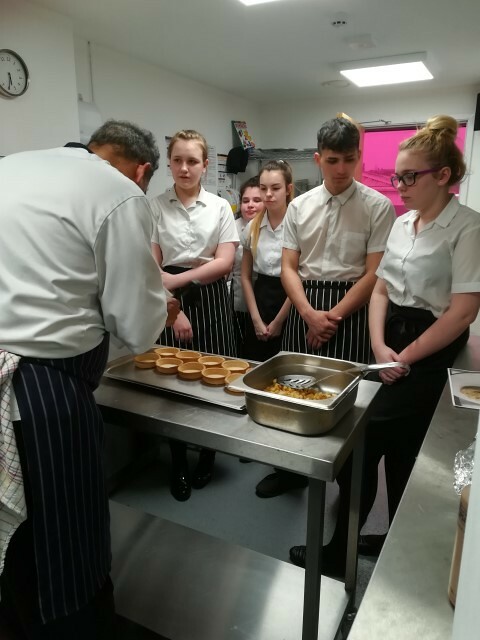 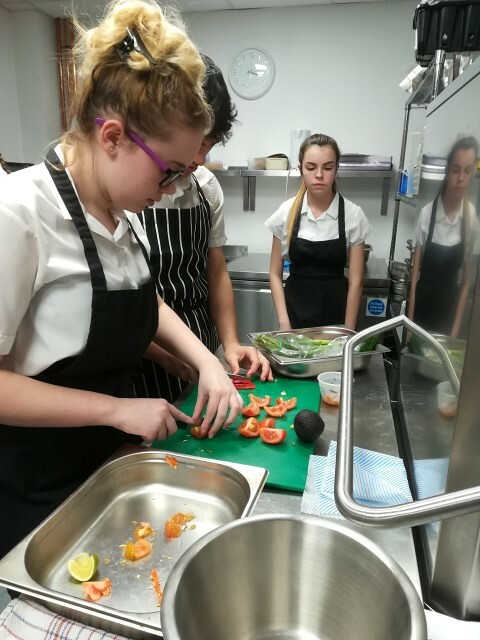 In true Masterchef fashion, each course was introduced by the students before being eagerly sampled (and in most cases devoured) by the diners. 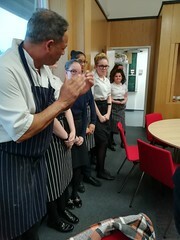 At the end a well-deserved round of applause was given for three great and very tasty dishes. 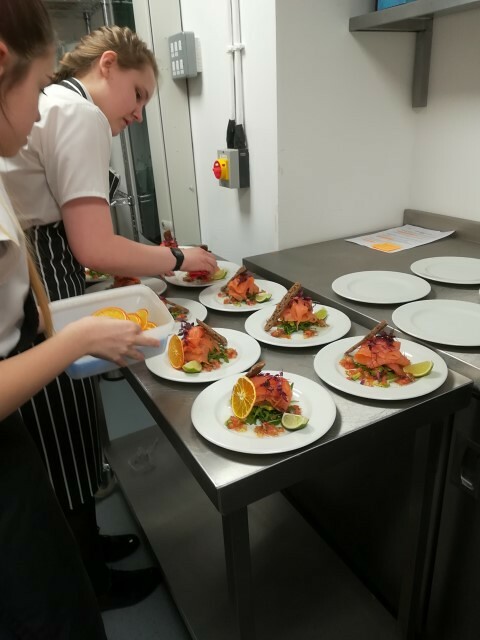 The menu consisted of: Starter – Scottish smoked salmon timbale served with an avocado and tomato timbale, with a tomato and onion salsa, mixed herb salad and lemon oil. 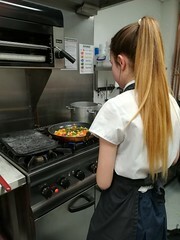 Main – chargrilled chicken breast served on a bed of Mediterranean vegetables. 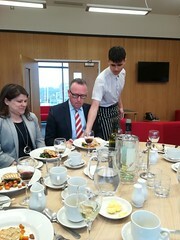 Finished with wilted spinach and fresh mixed herbs. 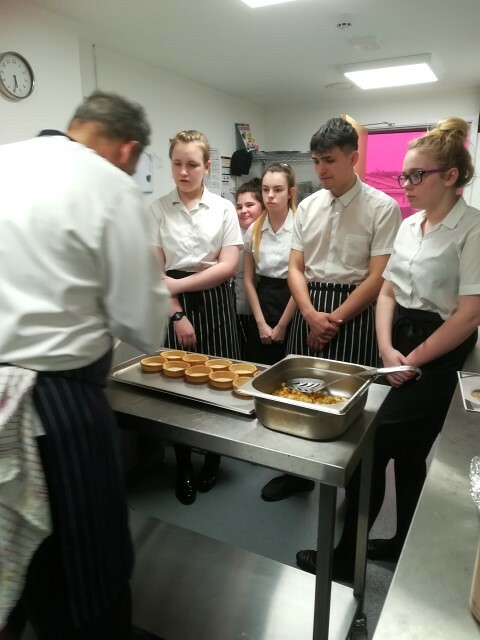 Dessert – toffee apple crumble tart served with vanilla ice cream. 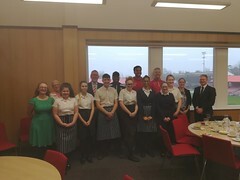 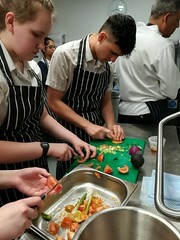 Fleet director Stuart Butler-Gallie said, “This was a great initiative and we were delighted to give the students this opportunity to put into practice all they have learnt in their GCSE year in a challenging but rewarding environment. 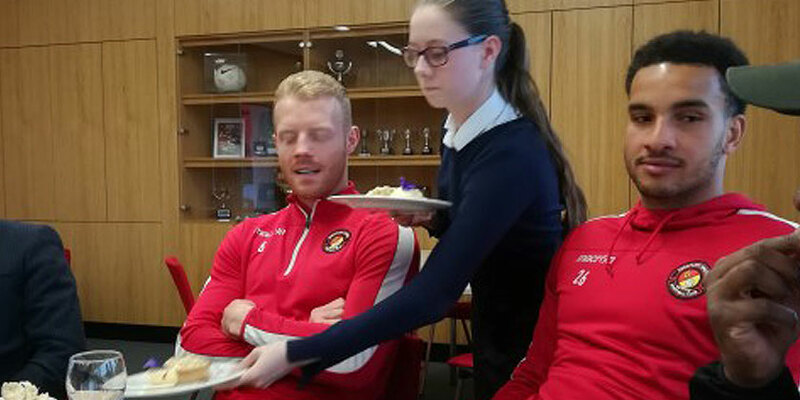 The Ebbsfleet Academy students really lived up to their school motto of Aspire & Excel. 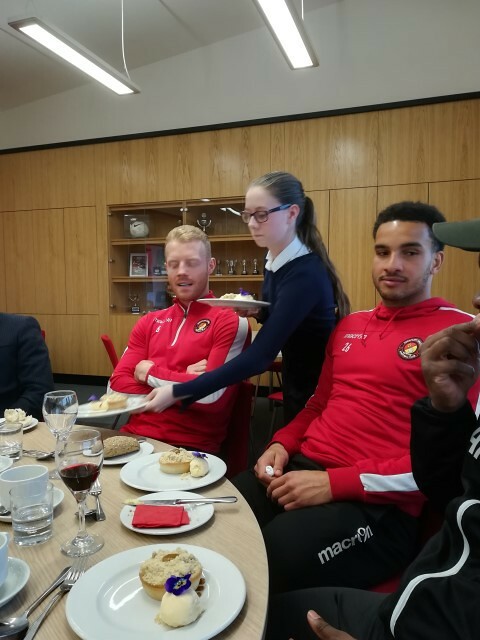 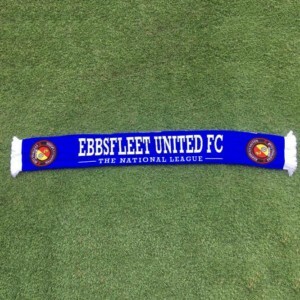 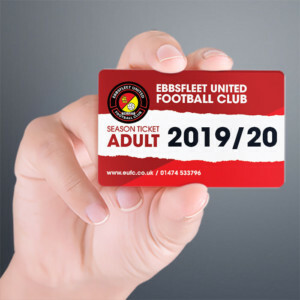 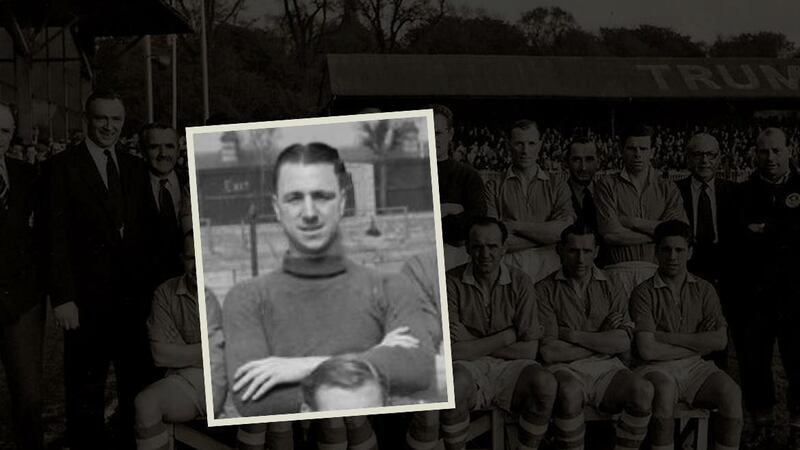 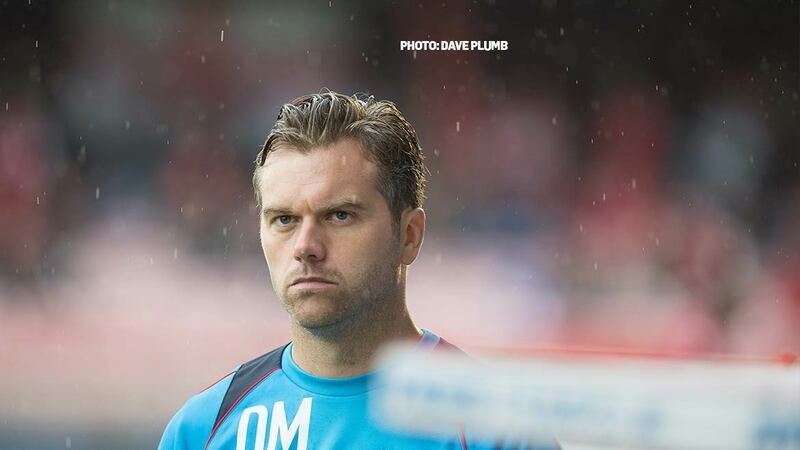 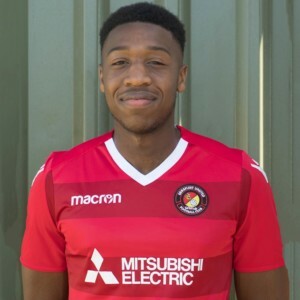 They put a huge amount of effort into planning and executing three fantastic dishes that EUFC would have been proud to present to its sponsors and fans dining in our restaurants on a match day”.